A Tarot Meditation on VII: The Chariot | Robert Mitchell Jr.
At the beginning of March I began working through Donald Kraig’s book Modern Magick: Twelve Lessons in the High Magickal Arts. Part of the program is completing a daily Tarot Meditation. As I’ve mentioned before, I’ve been a student of the Tarot since the 70s, and I’ve been meditating almost as long. And I’ve meditated on Tarot cards before. But it’s simply amazing the things you can find — even in terrain you think you’ve explored pretty darned well. Last Friday I sat down to meditate on VII The Chariot. I settled into meditation, taking note of the solar imagery and connecting that to the Solar Chariot myths found everywhere from Ancient Egypt to Denmark. I relaxed and “sank into” the card. Then, although I’ve looked at this card a million times in the last forty or so years, I noticed that the natural focal points of the image are seven in number. That seemed curious and probably not coincidental. Then, in my mind’s eye, I connected them with lines. The natural focal points on the card are the seven lowest Sephiroth, the ones just below the level of the Abyss. 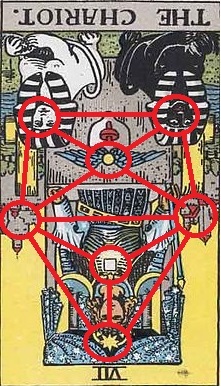 The glowing square on the figure’s chest equates to the Sephira of Yesod, which is the vehicle through which all of the powers from the Sephiroth above are conveyed into the material world of Malkuth, which is the eight-pointed star on the figure’s forehead. Note that the winged sun on the chariot itself equates to Tiphareth, the Christ point. The figure can go nowhere without this power. If you are familiar with the Qliphoth, the spheres are different. And yet, to me at least, the overall message is strangely similar. 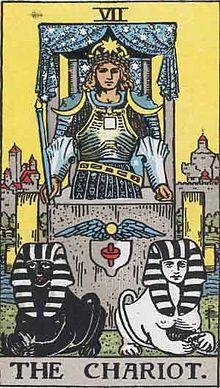 To me this card symbolizes the maximum human attainment, the highest degree of achievement, the greatest victory short of attaining personal godhood. But being upside down, it is also a warning. It says that victory has its costs, difficulties and dangers. This entry was posted in Mysticism and tagged chariot, tarot, VII. Bookmark the permalink.